On Saturday, January 21st, hand on heart, I helped to make history. Â In a small way, it is true, but still: I was there. 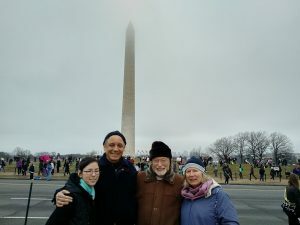 I was a part of The Womenâ€™s March in Washington, DC. 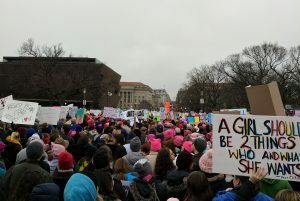 In that vibrant sea of pink hats, warm coats, and gloriously untidy hand-made signs, I ambled, chanted and whooped and hollered with my husband, and with family, and, with them, felt one with the crowd. It was a happy, exciting, and exhilarating moment. But what was all of this for? Thatâ€™s an important question. Â But itâ€™s not such an easy question to answer. Â Was it just against Trump? Â In part, yes. Â But there was more. In that long, dense, and noisy serpentine mass that during the day wove across the National Mall in Washington, DC, through the streets of Chicago, down Fifth Avenue in New York, and in various-sized cities across the United States and around the world, there was no single voice. Â What we heard, what we saw, what we contributed to was a fragmented mass of pieces and soundbites of resistance and vision. And still, when all the small messages were added together, the unified voice was this: we want a country and a culture that respects inclusion, caring, and a passion for justice. In communities all over the world that same overarching message was beaming through. 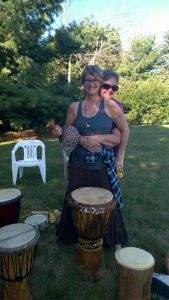 For people who do timebanking, this collective vision is instantly and startlingly recognizable, for it is exactly what timebanking was created to achieve. As an idea, timebanking is inspiring. Â As action, itâ€™s transformational. Just as inspiring, just as transformational in its concentrated, local way as was the march. Across the country and world, the timebanking movement has driven hundreds of thousands, even millions of hours of giving and receiving that have helped to reweave communities and reshape individual lives on a local level. But if truth be told, timebankers and the timebanking movement have been on the whole a quiet, rather than a noisy force for achieving its great vision. So, here is the question for timebanking leaders: Â Should we still be so quiet? Â Do we want to continue being behind the scenes as much as we often are? Timebanking leaders â€“ most of whom are women â€“ are resourceful, resilient and committed. And, if ever there were a moment to step forward, speak out and bring more aspiring female leaders into our movement, it is now. Letâ€™s make this moment more than just a moment in time. Â We in the timebanking movement can help enlarge it. We can help expand it. We only need to take action. And share the actions that we take with others. Here’s a pledge: If you talk, we will listen. Â If you act, we will celebrate your action. So letâ€™s get to it together! Email us at info@timebanks.org if you have any questions or ideas for the role that timebanking can play going forward.